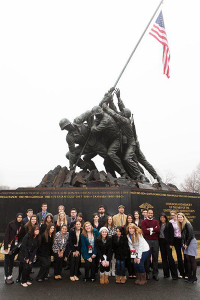 Home > News > Students take part in Inauguration in D.C.
Students take part in Inauguration in D.C. I stuffed the last bit of clothing into my suitcase and zipped it shut. My time in Washington, D.C. was over and I was heading back to Quinnipiac. In December I took a chance and responded to an email about a 10-day seminar through The Washington Center, Inside Washington 2013: The Presidential Inauguration, with Professor Scott McLean. This three-credit course is typically reserved for upperclassmen, but only available every four years. This was my chance to have the experience of a lifetime, so I applied. To my surprise, I got in. Each morning, prominent figures spoke about significant issues, the presidency, and President Barack Obama’s failures and successes. These speakers ranged from Eugene Kang, Special Projects Coordinator and Confidential Assistant to the president, to Grover Norquist, president of Americans for Tax Reform. We got a behind-the-scenes look at presidential debates and heard personal stories about the president, as well as advice from our speakers on how to make the most of our time in Washington. When the floor was open for those who had questions for Ben LaBolt, senior advisor of the Presidential Inaugural Committee and Obama’s campaign press secretary, I hesitated at first. It was the first session and there were more than 400 people in the auditorium. But I knew it was one of the once-in-a-lifetime opportunities I came to Washington, D.C. for, so I took the advice I had gotten earlier and I rolled with it. I was glad I did. Thanks to U.S. Rep. Rosa DeLauro, we had the opportunity to sit in on a session of Congress for one of our site visits and see the House of Representatives in action. Though we were slightly winded and our calves burned, our group navigated a myriad of metro stops and power-walked several city blocks to beat the rain and make it to the Capitol in time. We heard quite the spirited address from U.S. Rep. Sheila Jackson Lee on a bill for Hurricane Sandy relief during what Professor McLean dubbed as the most exciting session of Congress he’s ever seen. On our visit to CNN two days later, Quinnipiac alumus Eric Marrapodi gave us a tour of the studio. I was excited to see a television station on a larger scale and saw that I already knew how to do a lot of the work there after gaining experience with Q30. As if it wasn’t enough to see how successful Marrapodi is and how he has done incredible things with the passion he has for his job, we turned a corner and Wolf Blitzer waved at me and John King answered some of our questions about the industry. Despite our intensive journal assignments and capstone essay, many of us made the time for an Inauguration ball during the week, though it was not quite what we expected, as it was less formal and classy and instead more hipster and underground. After a lot of leg work we were all fortunate enough to get tickets to the Inauguration, but two friends and I were in a section pretty far from the Capitol. Instead of going and watching the Inauguration on a Jumbotron, we walked for three hours from Union Station to the CNN booth. As soon as we got to the National Mall and saw the back of Anderson Cooper’s head, we were almost more excited to see him than to see the Inauguration. I knew we made the right choice. 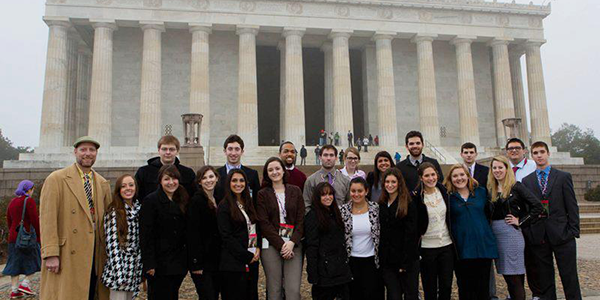 We were a part of the Inauguration festivities as well as the media coverage. To make it even better, we were on TV. Heading into this experience, I knew I had an interest in politics but wasn’t sure whether it was for me. Now that I am leaving Washington with four business cards, countless connections, and valuable experiences both in and out of formal sessions, I am more than ready to dive in and go back.